Here is a screen capture from a trail camera video of a nice whitetail buck. 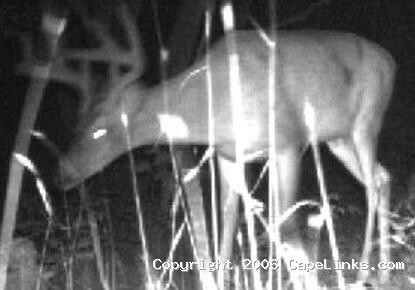 This photo was taken July 27, 2005 at 2:08 am in a small food plot in South Dennis, MA. You can see the deer’s eye reflecting from the infrared light on the game camera. This image has been viewed 9241 times and no comments have been submitted yet. You may leave a comment about this image. You can also view more Nature and Cape Cod images or learn more about Cape Cod.